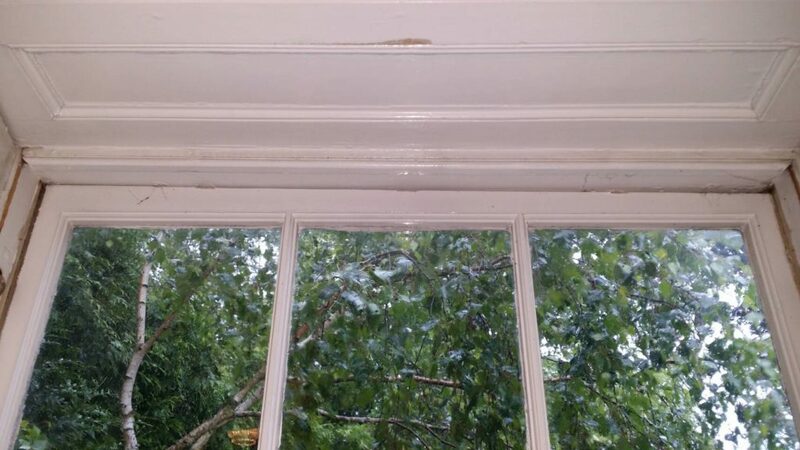 Home » Sash Window Advice • Sash Window Draught Proofing • Sash Window Repairs » What can we do with subsidence and wonky sash windows? Every London homeowner will come across a situation whereby the window frames and sashes do not sit square in the head of the box. This is perfectly normal and as a result of a hundred years of house movement and settling, if you prefer to call it that. Personally I do prefer the term settling because a large number of homes in London’s Victorian boom were built straight off four feet of sand! That is certainly not the kind of footings we would specify, or even allow today, but for the majority it works well (with the exception of those that will be reading this article of course!) and are no doubt looking for quality and relevant advice on how to solve this situation. In order to fix this issue we fully need to understand it. The principle is actually very simple – the frame has moved with the house and the sash has stayed square because it is much stronger than the longer framework built into the wall (which then of course moves with the wall. So before I even go into what it means for our home I will say that anyone with subsidence is fine because if the movement isn’t finished yet, there are plenty of methods to resolve it. Subsidence is simply the house slowly working its way into the ground. I think that is the nicest and most constructive way to put it. 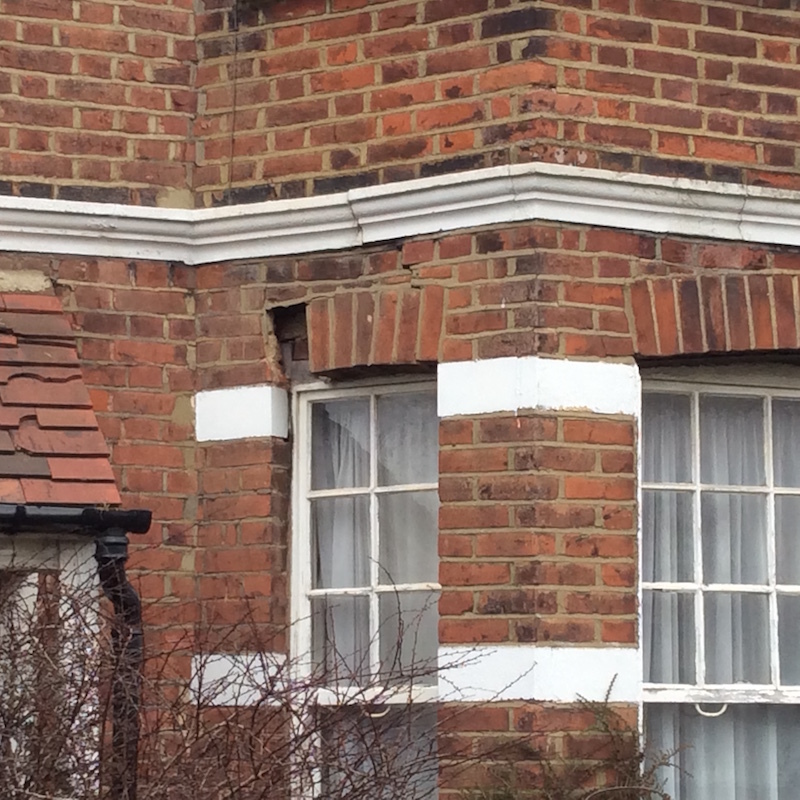 So let’s look at a really typical example of subsidence on a sash window and then talk about the problems that may arise, and how we solve them. 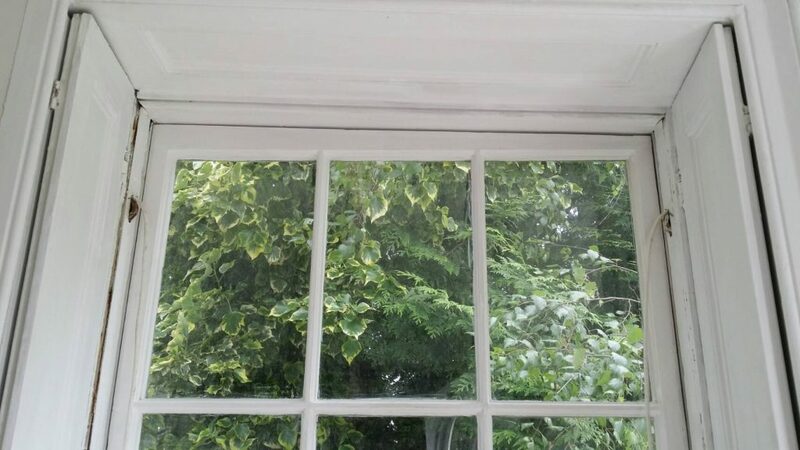 In this example we can see a sash window that has a larger gap from left to right. So this case is actually quite a mild one at the moment, and I apologise for that because we have worked on windows with two inches of movement! Unfortunately I didn’t photograph those! That said the example is perfect as I pointed out previously. Now to understand this you’ll need to read really carefully as it’s a little tricky. If we look at the gap on the right hand side we can see that is where the movement is or at least we might guess that. Unfortunately no, that is not the case and I wanted to highlight that for anyone facing this issue with an insurance company.I will come back to the whole insurance company thing a little later on to keep this understandable and clear here. However to complicate it a little further, and sorry for muddling this a little, it is actually the right hand side that has moved in this case but we can only tell this from the next picture I will provide, not from this internal picture. We have three options to tidy this up and make our sash windows draught proof. The first option would be to plane off the lower right hand corner of the sash to twist the sash in towards the top right corner of the frame. This option is the least favourable and should be avoided if possible. It will create a gap on the left hand side where we have moved the sash further to the right side pretty obviously. This gap is not easy to get a draught seal on because running draught seal up behind the gap will result in loss of travel, because lower down the frame will be more slender, thus not allowing the sash to travel if the gap is considerable. The second option is to plane off the top of the left hand side to nothing on the right. This will neatly allow us to install a draught seal across the top of the window. In the example provided this is the correct solution because there is not that much movement that the timber removed could structurally weaken the sash. That is the sensible approach. There third option which is used in extreme movement, which you may have so well worth mentioning. This method is to combine a little of one and a little of two and gently jig the sash in. This way we neither create large enough gaps up the sides of the sashes that draught proofing cannot work, nor do we plane so much off the top rail that the sash is structurally compromised. There is another situation where the sash movement is so extreme that plants are required onto the frame and sash themselves. This is not all that common and in the last 15 years I would say there has only been a handful of homes that required this so I will not go into significant detail here. Getting back to the correct decision in making the fix to the sash in order that we close the gap. We chose option two as previously mentioned and then the draught proofing system is rebated and installed into the sash. We plane off any paint that would hinder travel at this point as well. I have pictured the sash before priming so you can see exactly what is going on. 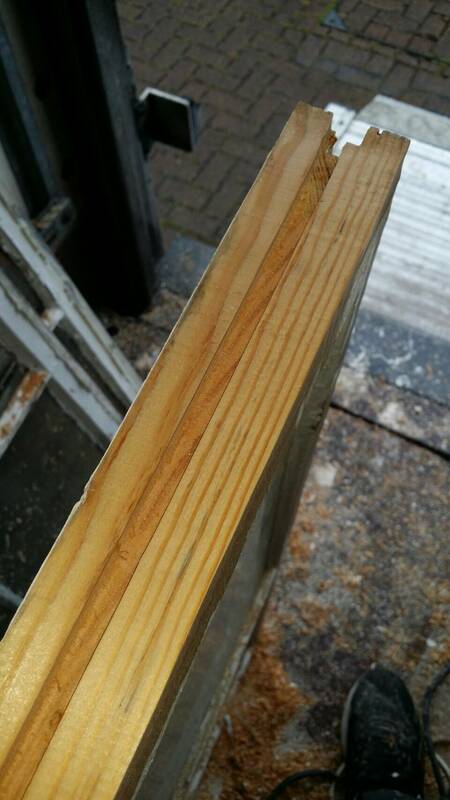 Sash eased in to fit head of the frame with draught seal groove cut out. So you can see the sash is neatly planed to help fit the head of the frame once all is put back together. 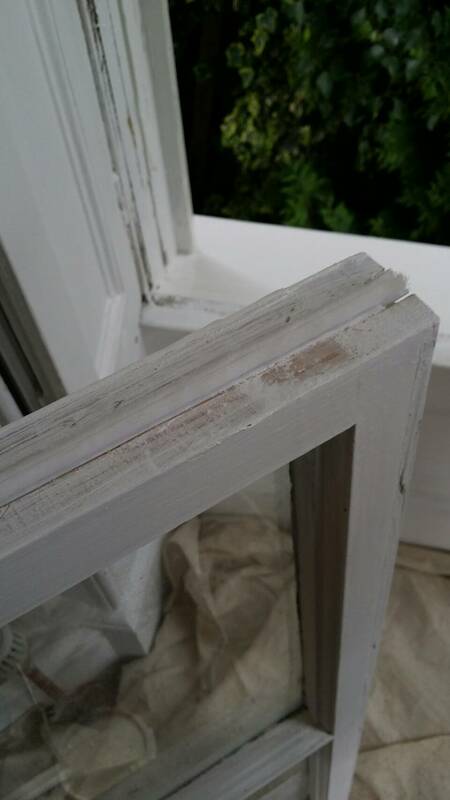 This is a typical part of our sash window repair service. Now below I have included a picture of the sash with a draught proofing system installed, and primed ready for the decorator to take over. Draught proofing system installed ready to go. The draught proofing itself is made of nylon and while I am not a fan of any plastic at all but this is really serving to improve the environment and will result in the heating being turned down for sure. Now with the sash primed and ready all that is left is to hang the sash and make sure we have fixed the issue. At this point I am going to have to offer a really big apology, I have taken a picture of the wrong side of the bay window frame – we have had to shoot in both sides of the bay which will become clear very soon when you see the external pictures. The principal is quite simple in this case. The bay has moved on both its pillars outside of the wall. As I pointed out previously this is the perfect example of movement. The pillars that were used in this case simply were not installed properly and movement ensued. The use of pillars like this was a design flaw because it was always going to be clear the weight could not be handled this way without casting a ring beam on top of the pillars first. This was not done and the result, over time is the movement of the frames. How do I know if my house is still moving? So now we get to the important question of is my house still moving? There is no certain way to say no, but there are some really obvious ways you’ll know if the movement is significant enough that you should contact the insurance company. If you notice wall paper breaking open, or plaster cracking and this is a fresh crack, that you could insert a pound coin, then you should immediately contact the insurance company. Do not waste any time over this because insurance companies will be slow to react already and it can be urgent if the movement hasn’t finished. There is no way to put back to original condition, the best that can be done is the movement stopped so do not delay! Another serious situation is when internally you can see fresh cracks in the mortar, and if really dangerous, the bricks will break as well. This is extremely obvious and should be looked out for. It’s also extremely dangerous because it will mean external, curved, brick arches are vulnerable as well. Please take a look at an example of a brick archway collapsing. Notice that the bricks have fallen away but the house has not fallen down, it’s not life threatening, but it is obviously a serious concern and must be dealt with straight away. If you catch a problem early you will never see this situation in your home. Contacting the insurance company and what to expect? The insurance companies all seem to have a similar way of handling this. They will pop around and insert pins into your wall and then schedule a date to check that movement has stopped, If movement has not finished, they may try to stall you, and check again, absolutely please do not accept this easily. There is no way for them to honestly know that they are not causing further damage of your property at this point. The acceptable procedure at the point movement is discovered to be fresh quite simple – underpinning. 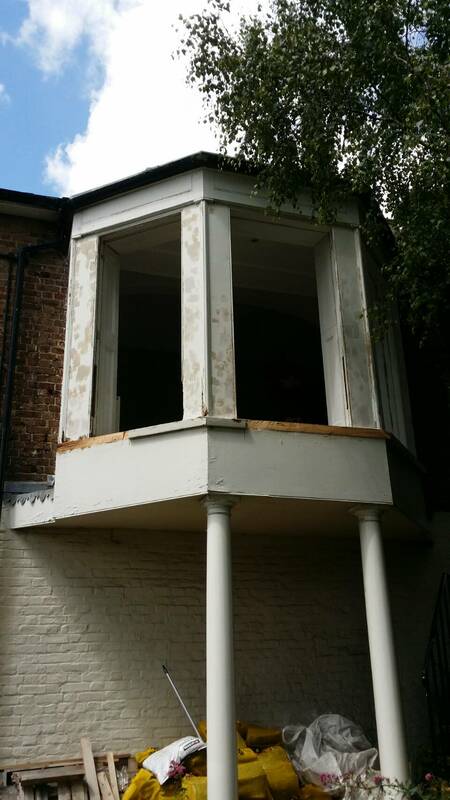 Once a date is set for underpinning and we are sure the structure is now good, we can look at remedying the issues with your sash windows that are created by the movement itself.